For the individual with mobility difficulties, a commode lift may be of great assistance. Designed as an aid for individuals suffering from motor difficulty or disability, commode lifts are an invaluable tool in preserving independence as well as personal dignity. With a wide product variety of toilet seat lifts, in both motorized and non-motorized models, this allows for a toilet lifting seat to fit every budget. Within the home environment, a commode lift offers independence to the individual who is unable to get onto and off of the toilet unassisted. Commode lifts reduce falls, thus allowing for increased safety within the home environment. 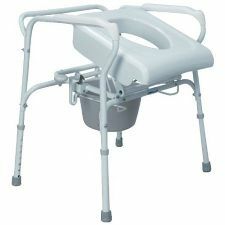 If an individual is incapacitated as a result of an illness or an injury, the use of a commode lift may assist in a faster and fuller recovery. Additionally, commode lifts often allow individuals to remain in their own homes longer than would have otherwise been possible. Commode lifts offer dignity, independence, and safety to disabled individuals. Toilet seat lifts and commode lifts are useful for individuals who have suffered a traumatic event such as a stroke or a hip fracture. Both of these health issues require an extensive rehabilitation and recovery period. With a toilet seat lift, one can get off a toilet without straining or re-injuring previous ailments. The last thing you want after using a toilet is to force your body back up to standing position. The installation process for commode lifts can be quite simple. There are some configured to fit perfectly over your standard height toilet. The commode lift can raise your standard height toilet an additional 2-4 inches and instantly create a raised toilet seat. Commode Lift That Fits Over Standard Toilets – This commode lift can also be used standalone. These lifts vary widely in price, ranging from under $100 for basic non-motorized toilet seat lifts to upwards of $500 for motorized toilet lifting seat options. Maintenance on commode lifts varies, as motorized commode lifts have some ongoing maintenance requirements that non-motorized commodes do not have. Replacement parts for motorized commode lifts are widely available to caregivers. Individuals with motor difficulties are wise to consider a help get off toilet product such as a commode lift. It could mean staying in their own home instead of residing in a rehabilitation facility or nursing home. Lifting patients can often lead to back injuries, especially when these lifts are performed periodically. For this reason, the technology known as lift assist equipment has been implemented in the hospitals. However, home caregivers, friends and family members might also benefit from using lift assist equipment. What is the Lift Assist Device Used For? The lift assist equipment is often used to move patients from the bed to a wheelchair or from a wheelchair to a chair. There are different types of lift assist equipment available depending on the medical condition of the patient. For example, some patients should not be lifted vertically and there is instead a horizontal lift assist device. One type of lift assist device is a gait belt, which is a device that is designed to place less strain on the patient’s back. The belt is worn around the patient’s waist. Another system that is commonly used is the ceiling track hoists, which is a device attached to the ceiling that allows the patient to be carried horizontally. Then, there is the Hoyer lifts, which lift a patient by a cradle and a boom. This device is like a crane and will lift the patient vertically. For situations where the lift assist devices are too expensive, more affordable alternatives include the sliding boards and sliding sheets. The sling lift relies on a piece of fabric being placed under the patient. The fabric must be strong enough to hold the weight of the patient. The sit to stand devices are designed for patients who struggle to stand on their own and rely on vests, straps or belts. They help patients get into a position where they can support their own weight. How Much do Lift Assist Devices Cost? Lift assist devices have costs that vary depending on the features found in the device. The cost of the Hoyer lifts can range from $400 to $4,000. The cost of the device is partially dependent on the lift capacity of the device. Gait belts have a much lower cost and can range from $5 to $40. Track hoists can range from $2,000 to $3,000.